Warholized Drosophila melanogaster. Image by Michael W. Vitalini. Registration is now open for the 60th Annual Drosophila Research Conference! In the fall of 1958, a handful of colleagues met to talk “more or less endlessly” for two days, mainly about the fruit fly Drosophila. Most of the dozen or so participants were members of James F. Crow’s laboratory at the University of Wisconsin–Madison. Sixty-one years later, more than 1,500 Drosophila researchers from hundreds of labs are expected at the direct descendant of that first informal gathering. 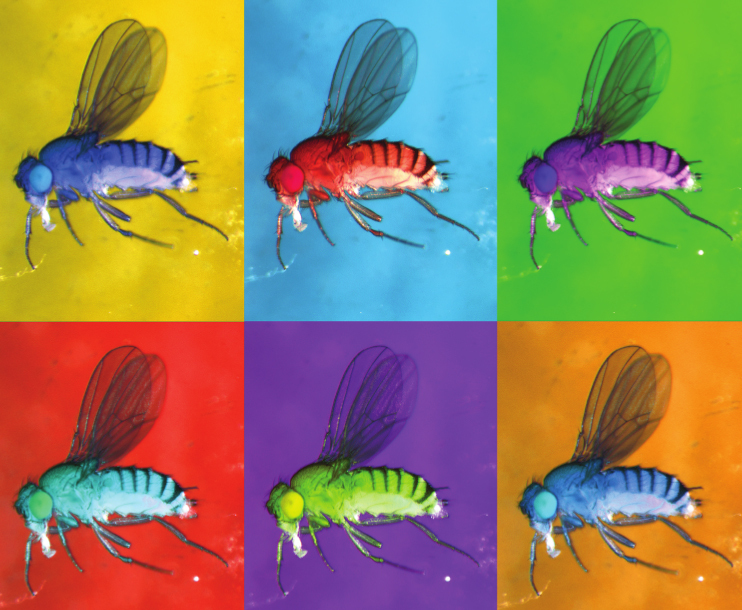 The 60th Annual Drosophila Research Conference will be held March 27–31, 2019, in Dallas, Texas, and will continue its decades-long tradition of strengthening the Drosophilists’ collegial spirit while highlighting the productivity and technological sophistication of their chosen model. We can see the practical effects of that spirit in last year’s attendee survey: 70% of attendees said they met people at the meeting with whom they would likely collaborate, and 30% said they arranged to share a reagent. Alongside these traditions, the fly meeting continues to evolve. In 2019, the conference will include a plenary session dedicated to new tools and technology, a nod to the prominent role the community plays in methodological advances. Also new this year will be a pre-conference grants and funding workshop, plus the return of last year’s popular professional development and community building programs, such as the New Faculty Forum and the Community, Connections, & Lunch discussions. Check out the speaker and special event lineup below and start preparing your abstracts! The abstract submission deadline is November 15, 2018. (Read invited speaker bios here). Your first faculty appointment brings many new challenges. Network, learn, and find support at the New Faculty Forum, a one-day workshop designed for new faculty and advanced postdocs. This program aims to provide attendees important information related to grantsmanship and funding. Attendees will hear talks and discussions from experienced investigators and program officers. This workshop will provide an introduction to peer reviewing for early career researchers, including graduate students. The workshop will cover best practices and a mock review. Reconnect with the fly community, meet new colleagues, and learn from stimulating discussions on topics you care about! Join us for lunch with moderated discussion tables on scientific, professional development, and other topics. Students and postdocs are invited to join journal editors, including editors and editorial staff from the GSA journals GENETICS and G3: Genes|Genomes|Genetics, over a light lunch to discuss the ins-and-outs of getting your articles published. Amplify your work and seek expert feedback by inviting specific scientists to attend your poster presentation. Student and postdoctoral GSA members may invite up to three scientists to attend their poster. At this event you will learn tips and tricks to communicate who you are as a scientific professional and will workshop your CV or resume.